Low Prices Shipping by Container to Banjul Gambia, in 20ft / 40ft / 40ft/HC Containers | Ship your Car ,Van , Truck , Personal items and Household goods.... to Africa. Container shipping method to Banjul Gambia, at Seakargo we offers a secure and safer way of shipping your personal items and vehicles (Van Car Truck Lorry and all type of vehicles.... ) to Banjul, Gambia. We can load and secure your vehicles/cargo in 20ft and 40ft 40ft/HC containers at our warehouse before being shipped to Banjul Gambia. 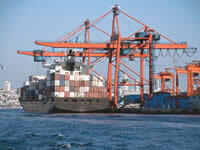 We also offer both door to port and port to port container shipping service to Banjul, Gambia. We offer container loading and lashing service at our warehouse in every port in the uk, alternatively the containers can be delivered to your address for loading. We ship containers to Banjul Gambia on a weekly basis from the UK. If you need a competitive quote for shipping your car to Banjul, Gambia, or you are moving to Gambia and need your household items shipped, you will find our prices the best in the market place, seakargo has been able to negotiate affordable shipping rates to Gambia. The volumes we move every month has put us in contention as one of UK’s leading international shipping company to Gambia. Seakargo Shipping Services can assure you peace of mind as we have many year's experience within the shipping and forwarding industry, we will ensure that your cargo will arrive on time and in the same condition that you left it in for when it arrives in Banjul Gambia. For all your car or personal items shipping needs whether it be to Banjul, Gambia or to anywhere else in the world, please contact us for a free no obligation quotation today. 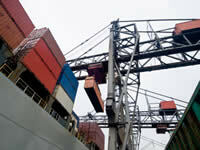 Full Container Load (FCL), is the standard form of shipping freight for those who have a large amount of goods to send. The FCL definition seems to imply that you have to fill the container totally, but in fact, this is not the case – you are renting its exclusive use but if you cannot use every square metre it may still be the cheapest method. You have to calculate, versus the option of LCL Shipping (Less than Container Load), whether FCL transport is the more cost-efficient. As a rough rule of thumb, if you have 12 pallets or more, FCL freight is likely to be the better solution. Other advantages are that you have less risk from other peoples’ cargo, and there is no bumping from the LCL consolidation/deconsolidation process. If you have fragile goods this can be a deciding factor in favour of FCL Shipping. The bulk of shipments are commercial goods, and the system of moving standardized, stackable steel boxes around the world has flourished thanks to the creation of International ISO standards. Increasingly used by bulk shippers is the Hi-Cube 40 foot, which has a 9 ½’ height. There are also refrigerated containers, which can be broader at 2.6m width. Other specialist types that you may encounter include Flat Rack, Open Top, and ‘heavy tested’ 20’ containers that are suitable for heavy machinery. The maximum payload mass for a 20’ container is approx. 22 tonnes: and for 40’, approx. 27 tonnes. The choice will depend on cost, your level of preparedness for loading the shipment, and the arrangements you have with your consignee at the other end. Modern Full Container Load transport is usually fully computerised and able to provide transparency so that we will be able to track and trace the progress of the consignment. You can elect to have an empty container dropped off at your premises. Be ready to load soon as the container arrives to avoid extra charges. You will be responsible for the condition of the packing so ensure that it is well done. For overseas shipments you may require special ‘export packing’, often carried out by a specialist firm. We will arrange collection from them and transport to the shipper at the port. The container is sealed until it reaches its destination. There is no-one else to blame if you do not carry out the container packing to the required standards. If you opt for a Live Load, the container is brought to you and you have 2 or 3 hours to load and secure the consignment before an hourly surcharge kicks in. Less stressful is the Drop and Pack service where the container is left with you for an arranged time of 1 day to a week. It is a good option for people moving house abroad. It does cost more, though. Containers are in use as temporary storage (or even as buildings) all over the country and can be bought or rented. If you want the flexibility of being able to hold a container for a longer period before sending it abroad, then speak to us and we will arrange it for you. Make sure you specify that it is for eventual shipping use because it must meet ISO specifications. Get instant freight prices and view sailing options. If you like what you see you can book it. We will then contact you to confirm the booking and finalize the paperwork. Your goods will be collected on the agreed date and shipped to their destination. Whether you have full loads (FCL), or groupage loads (LCL), whether port-to-port or door to port, through to final delivery at destinations worldwide - we can handle your needs. Our international network of offices and sea Kargo agents is equipped to deal with short sea / deep sea shipping requirements to and from anywhere in the world. This means that our coverage of routes and options gives you the fullest possible service. A major advantage with Seakargo is that as an independent freight forwarder, we are not tied to any specific shipping line nor restricted by agency agreements. This independence has allowed us to build up a large portfolio of sea freight services, offering some of the most competitive rates and services available. You simply decide what you want and we will tailor the best priced options to suit your individual requirements. With over 10 years' experience in worldwide sea freight services from all major UK sea ports and terminals, our portfolio covers virtually all major sea ports worldwide including those ports requiring feeder vessel delivery. As you would expect, the service and flexibility we can offer is second to none: the personal nature of our operation means that your needs will be met first time, every time. 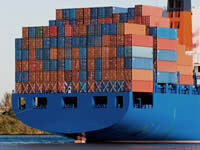 Please contact us to discuss your sea freight requirements. "I have now used Sea Kargo on three occasions. Each time, it has been in order to import a motor..."